Students are getting a true visual understanding of steel framing and steel connections from the more than 170 Steel Sculptures at colleges and universities across the United States and around the world. These Steel Sculptures are valuable teaching aids that exemplify the many methods of steel framing and their corresponding connections. To begin the process of having an AISC Steel Sculpture erected on your campus, you may download an electronic set of detailed drawings that can be used to fabricate the sculpture. Many schools have relationships with local steel fabrication companies. Sometimes these fabrication companies donate, or provide at reduced prices, the fabricated and erected steel to the schools based on the drawings that we provide to you. Note: Due to variations in local site conditions, foundations for the sculpture must be designed locally. Please remember to keep AISC informed of the status of your steel sculpture. We strive to keep our list of sculpture locations and our Flickr album up-to-date. Click the image below to be taken to our Flickr album, or hover over the image and use the arrows to scroll onscreen. The original steel sculpture was erected on the University of Florida's campus in Gainesville on October 29, 1986. Created by Duane Ellifritt, Ph.D., PE, Professor Emeritus of Civil Engineering at UF, the structure was envisioned to be a full-size 3D model that would provide engineering students with up-close, hands-on exposure to structural steel members and connections. A few years after the first sculpture was installed, AISC requested and received permission to use and promote a scaled-down version of the sculpture as a teaching aid. 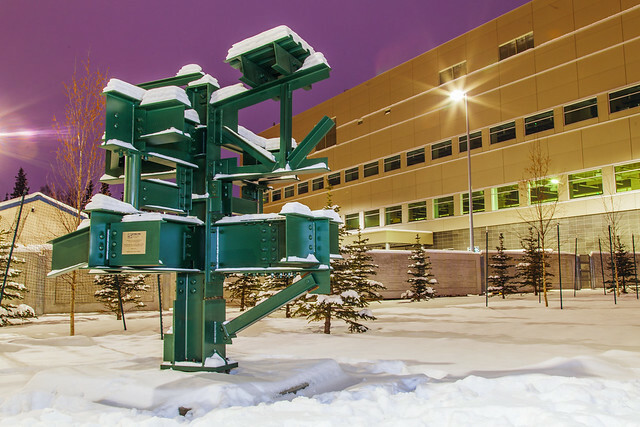 Modified versions of the original steel sculpture now exist on more than 170 campuses worldwide. A full list of locations can be viewed below.